It’s turning out to be a long, hot summer. We took a vacation in May, but here it is, July and that trip feels like a distant memory. And there’s still nearly two months of summer left! Without a weekend getaway in site, our summer celebrations will be happening in our own back yard, literally. Luckily, we have a grill and swimming pool (in Florida, pools are as common as a garage)– so that’s almost like vacation, right? Especially when you’re munching on Chunky Salmon Cucumber Dip. Anytime we’re relaxing and entertaining in the summertime, it’s most often done poolside. With everyone in their bathing suits, icy drinks in the cooler, music in the background, Scott attending the grill and plenty of tasty bites to chow before the main course. I like a mix of healthy options along with salty, crunchy nibbles, like pretzels, nuts and chips. A homemade dip makes it festive. 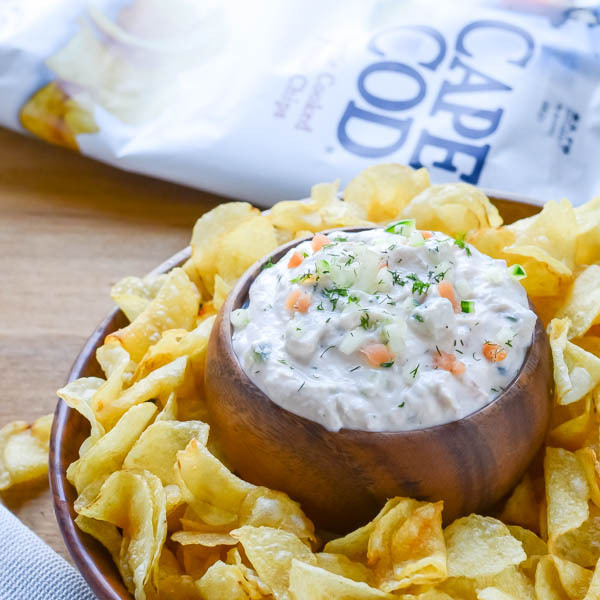 Cape Cod® Potato Chips are my go-to chip when I’m making dips for a crowd. 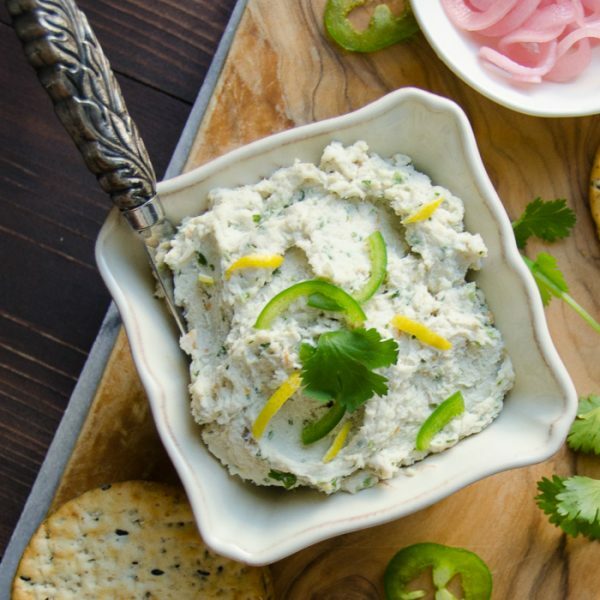 They’re sturdy, uber-crunchy and they’ve got the fortitude to stand up to even this chunky salmon cucumber dip. 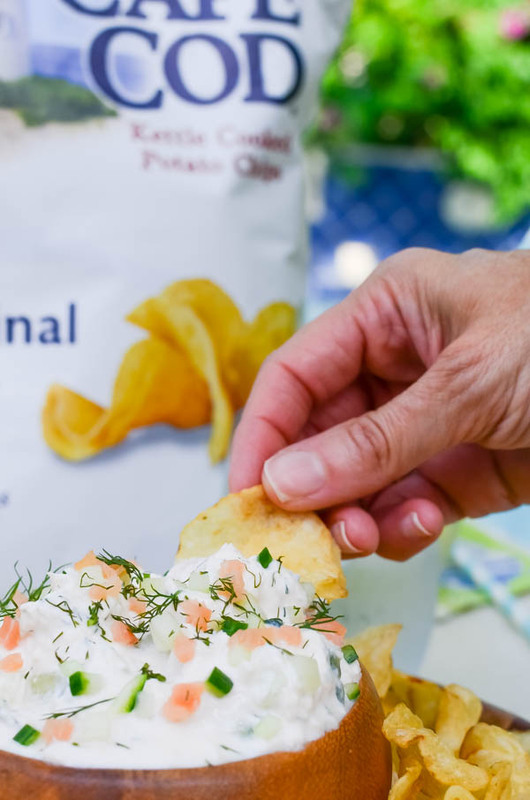 With Cape Cod and Kettle Brand® Potato Chips, both made from simple, high quality ingredients, you’ll have endless snacking possibilities all summer long. 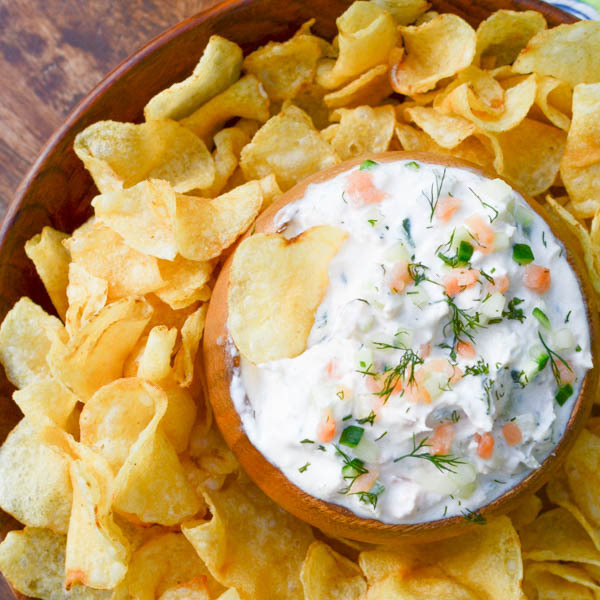 If you have a thing for smoked salmon, like we do, you’re going to go ga-ga over this dip. It only takes a few ingredients and it’s ridiculously easy to make. Plus it can (and should) be made ahead of time, so you don’t have to fuss at the last minute when you’re having guests. Isn’t that what entertaining is all about? Actually enjoying your company? 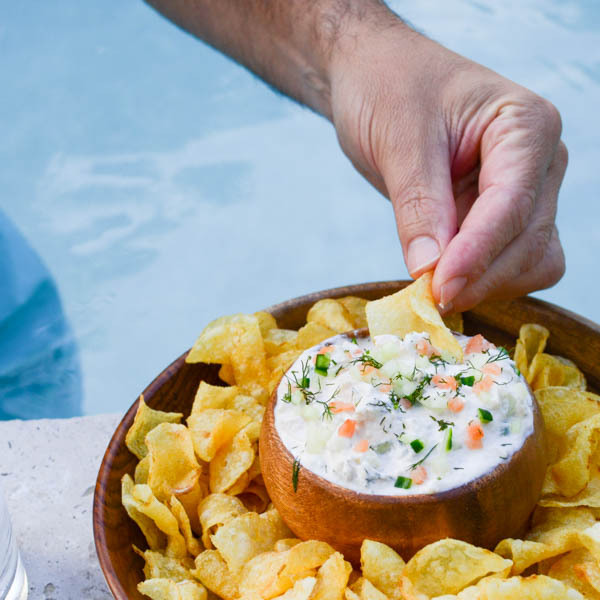 With this 10-minute dip and a selection of Cape Cod Potato Chips or those outrageous Kettle Brand Potato Chips, you’ll have something to satisfy everyone’s summer snack cravings. Did I mention how quick and simple it is to make? Only 10 minutes — and that’s if you’re a slow-chopper. Just add salmon, cream cheese, greek yogurt, lemon and horseradish to your food processor and pulse it until it’s smooth, then stir in the diced cucumber and extra salmon. The extra salmon and cucumber gives the dip a chunkier consistency and because half of the salmon is diced, the dip tastes less fishy than some other salmon dips I’ve tried. Refrigerate the dip so the flavors can come together — and go work on your music playlist for the party. Spoon the creamy, chunky dip into serving bowls and sprinkle with the garnish. 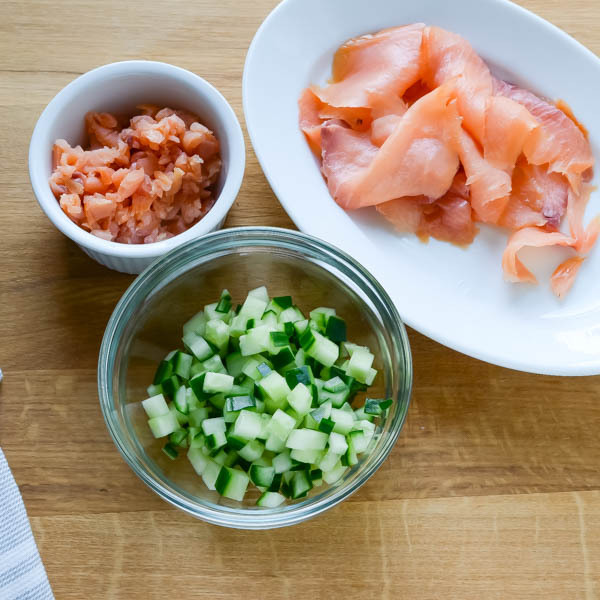 I like to use a little extra cucumber, salmon and dill, so the guests get an idea as to what’s in the dip, but you could switch it up with finely diced red onion, red or yellow bell pepper, and/or some “Everything Bagel” seasoning mix. Do you have a special dip recipe that pairs perfectly with these chips? One that you love to make for your family and friends? Now’s the time to show it off, because when you post your snacking moments in the sweepstakes below, you’ll be entered to win some pretty great stuff. (57) Daily Winners- winners will receive a $50 prepaid Visa gift card to stock up on snacks at their favorite retailer. To enter the sweepstakes, post a photo of a favorite snacking moment to your Instagram or Twitter with the hashtags#SnackSnapShare AND #Sweepstakes. Above is the photo I’d use for my entry… What’s your snack story? This savory salmon dip isn't too "fishy," the major complaint for most salmon dips. That's because only half of the salmon is pureed. The rest is finely diced and stirred into the dip. Finely diced cucumber, lemon juice and dill add freshness. Assorted Crudite such as bell pepper, cucumber spears, celery, carrots, etc. Finely chop half of the smoked salmon and set aside. 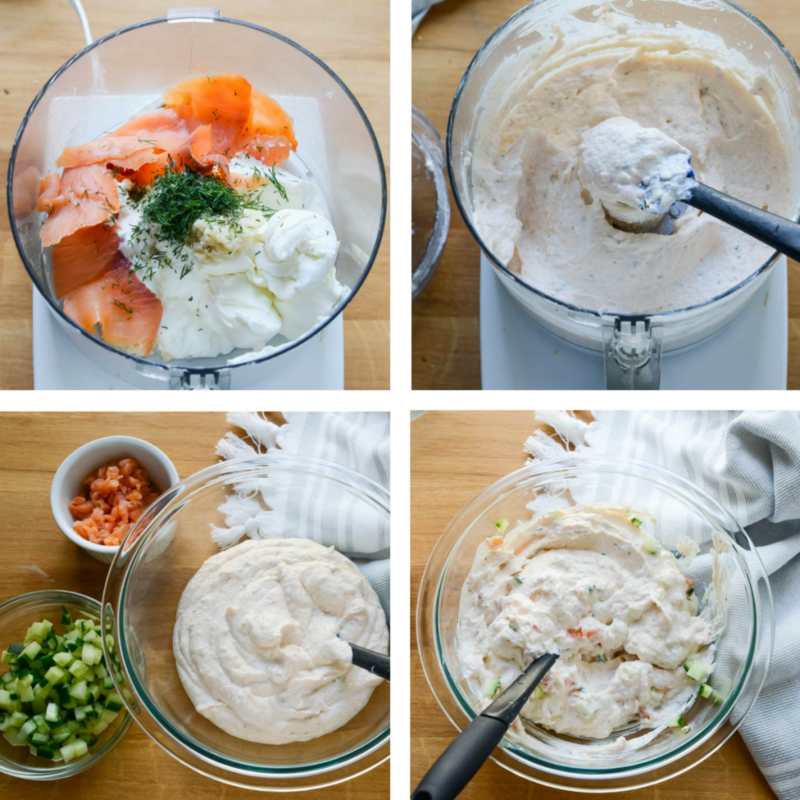 Into the bowl of a food processor, combine the remaining smoked salmon, greek yogurt, cream cheese, lemon juice, dill and horseradish. Process until smooth and creamy. Taste for seasoning, adding more lemon or horseradish as desired. 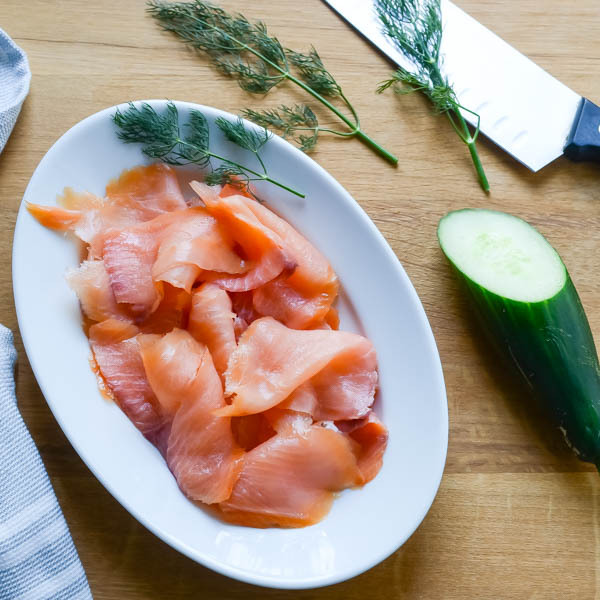 Transfer the dip to a medium bowl and stir in the finely diced salmon and cucumber. Chill for several hours so the flavors have a chance to marry. Spoon dip into a serving bowl and sprinkle with garnishes - or let the guests choose their own. Serve with chips and assorted crudite. No Purchase Necessary. Purchasing does not improve your chances of winning. The #SnackSnapShare Sweepstakes (the “Sweepstakes”) begins on 5/30/17 at 12:00 A.M. ET and ends on 7/11/17 at 11:59:59 PM ET. Legal residents of the 50 US/DC only, 18+. 43 Daily Entry Periods, 6 Weekly Entry Periods and 1 Grand Prize Drawing during the Sweepstakes. Void in US territories and Puerto Rico, outside the US, and where prohibited. Enter either by registering at www.bettersnackingforyou.com or by uploading an eligible photo via Instagram or Twitter using #SnackSnapShare and #Sweepstakes and. Odds of winning depend on the number of eligible entries. By participating you agree to the Official Rules. Sponsor: Collective Bias, Inc., 1750 S. Osage Springs Dr., Ste. 100, Rogers, AZ 72758. Cucumber dip is one of my favorite dips and now I get to add Salmon to it? Now thats a win in my world. It just so happens my sister Brough some fresh caught salmon from Alaska on Sunday so we have been looking for new ways to use our delicious bounty! I can’t wait to make this for her, finally a recipe she hasn’t shown me how to use all that delicious salmon! Fresh Caught Alaskan Salmon? I’m coming to your house! Poolside entertaining is the best and I can’t wait to make this! We love Nova, and I hadn’t thought to use it in a chip dip. What a great idea! 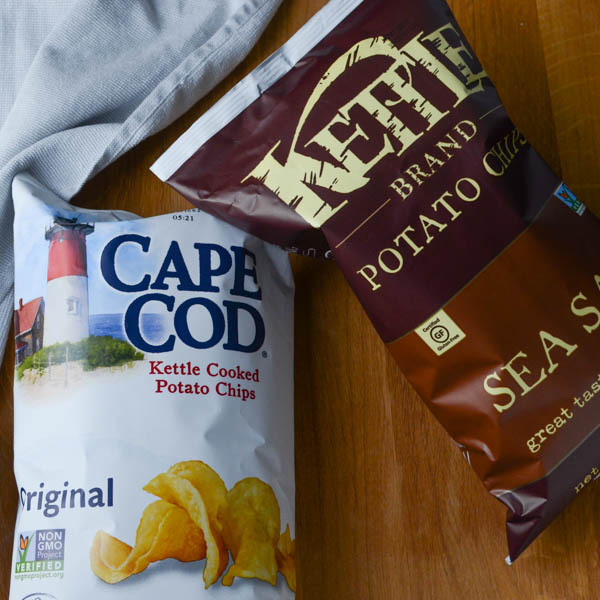 Cape Cod and Kettle chips are our favorites…there are 2 bags downstairs in the pantry right now, actually. All they’re missing is this dip! You’ll have to let me know how you like it, Amanda — put those chips to good use! Looks like a pretty tasty snack! I love smoked salmon but I’ve never made a dip with it before. The combination of flavours definitely sounds refreshing and tasty, and the perfect accompaniment to a nice crisp kettle chip! It does go great with a salty chip. Ok, I have been experimenting with smoked salmon recently. It took me a bit to convince myself I would like it. The combination of salmon, cucumber and cream cheese works so well. Dill (which I LOVE) just pulls it all together. 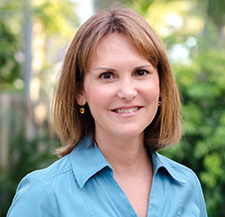 Thank you, Gloria! I think this is a classic combination and one I revisit often! A perfect dip combination. I eat these chips all the time. What a great recipe to scoop up with these chips. I know – aren’t those the best chips? Thanks, Peter! I want another vaca too! Enjoy the dip, Sarah! Looks so delicious. 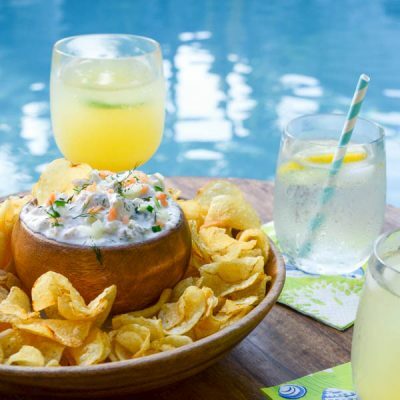 I wouldn’t mind chilling at the pool side with some chunky salmon cucumber dip. There are worse things, Charla! I absolutely adore salmon, but I’ve not been able to eat salmon or sushi for months thanks to being pregnant. Your delicious dip is killing me! I’d give anything to eat it right now. I’m definitely bookmarking this for a few months time when I can revert to my normal eating habits!! Congratulations on your pregnancy! Believe it or not, you’ll be eating sushi and drinking wine before you know it… With an adorable baby in your arms! This sounds so wonderful and fresh for the summer! Kettle Chips are my favorite, and any way I can get more Kettle Chips in my belly is a good thing! I agree — and chips with dip always feels celebratory to me. This looks so good! And this may sounds a bit wild, but I think I may like it in sandwich even, or with some pita bread. OMG!!! This looks like heaven to me!! I love that it has smoked salmon in it!!! Beautiful pictures of this dip, great dip even for some vegetable crudites! my favorite kind of dip for chips like these? 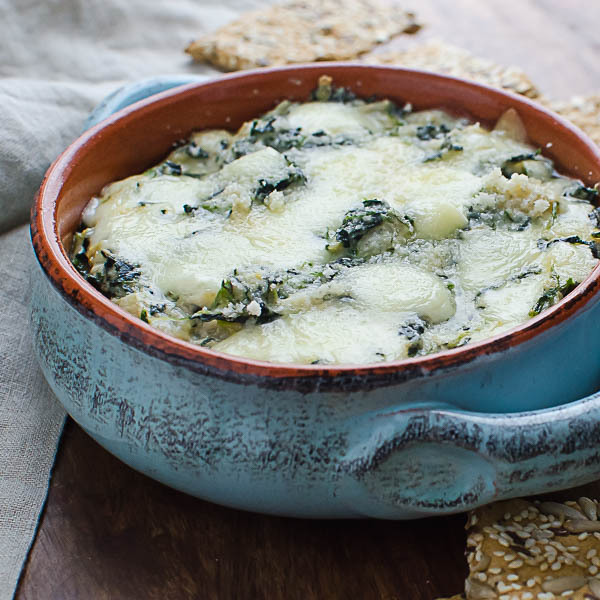 spinach dip or some kind of onion dip… or THIS one looks perfect! OMG – my cousin made a caramelized onion and bacon dip last weekend… I’ll get the recipe from her to share with you! 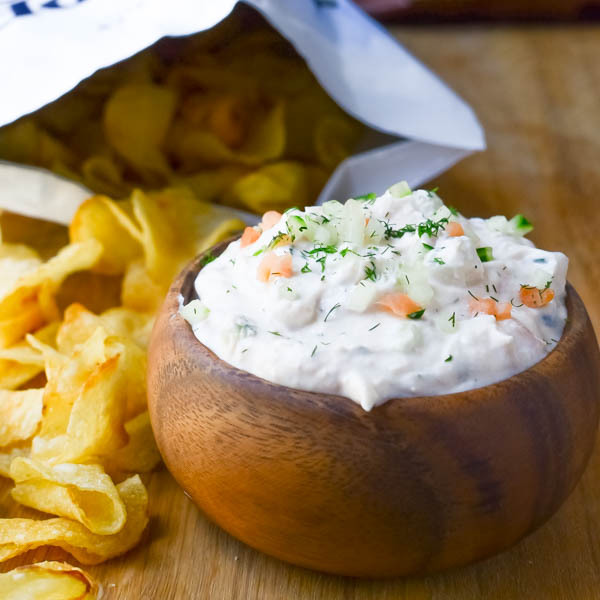 LOVING this dip and cape cod chips are one of our favorites for snacking and dunking! Thanks girly! Yes, those Cape Cod chips are a constant in our house. Ooh I love tzatziki but this really takes things to the next level with salmon. This is definitely not tzatziki. It has yogurt to lighten up the dip, but it’s a smoked salmon dip at heart. Gorgeous photos. I always forget about dip and how good it can be for sharing. Everyone loves a good dip! LOL! Yes, you’ll definitely want this for your next BBQ! Enjoy!